After spending a few months laying some roots and working in Santa Barbara, by late June, we were more than ready to hit the road. 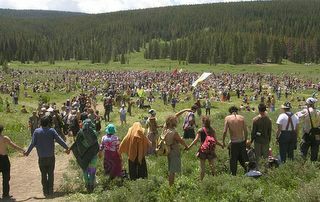 So it went, on a beautiful June day, we packed up and headed towards Steamboat Springs Colorado and the National Rainbow Gathering of the Tribes...the largest, free, completely non comercial gathering of hippies, gypsies, freaks and nomads in the world. Everything went smooth for the first few hundred miles, until just outside Las Vegas Nevada the bus began to sputter and cough, right before coming to a stop on the side of a very busy interstate in 111 degree heat. We tried for hours to get it to work with no luck.The cars were wizzing by at 80 miles an hour, inches from where we were working. It was around 6:30 at night when we decided to take what little money we had left and pay for a tow. We called up the nearest place and they said it would be at least a two hour wait. What could we do ? We waited, and waited, and waited..two hours stretched into four, then six..we called repeatedly and each time were assured they would arrive soon. Soon we saw the sky beginning to lighten and knew that sunrise was close at hand. The thought of sitting through another day of 111 degree heat was agonizing. Finally, well after sunrise the tow truck arrives and takes us to the nearest truck stop. The cost was near 200 to go 5 miles. It was a good safe spot where we could stay for a few days if need be. The time was 11 am and already the temp was near 100. Moss wasted no time getting to work on the bus. He worked for hours, even as the temp continued to climb to 113 degrees. I have never felt heat like this in my entire life. The candles on the wall were literally drooped over, like a wilted flower.The birds sat with their wings outstretched and moths open. It's all I could do to stay concious. There was a small water bottle that we kept filled and I went around the bus constantly spraying everyone down, including the birds and Gaia. ..but Moss would not stop ! Sweat was pouring from his head, there was no shade and still he continued to work. Honestly, Neither Stone or I understood how he was able to do this..but do it he did. Finally by late evening Moss had isolated the problem and fixed it. It was simply a small crack in the gasket on a veggie filter. By early the next morning we were off again with filters fixed and full tank of veggie. Earlier in the year we were given a Garmin, gps navigation sytem. You just type in where you want to go and hit GO! and it takes you there,telling you by voice when to turn.It knows all the rest stops,food, gas stations, shopping centers. I managed to get the gps coordinates for the gathering and puched them into the garmin, and we were guided the whole way by this thing. We chose shortest distance , rather than fastest time setting, which also tends to be the more "scenic" route. At one point we were guided 60 miles down a dirt road with washboards so bad we could go no more than 5 miles an hour ! 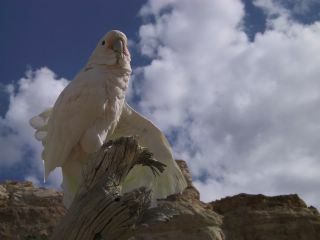 The scenery was beautiful though, huge red rocks dotted with sagebrush ..which of course we had to stop to pick some of. 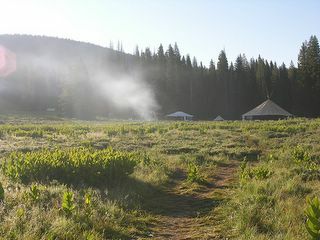 We arived at the gathering site around the 18 th of June...a very remote site in the rocky mountains, 10 miles down a dirt road and many,many miles from the nearest town. 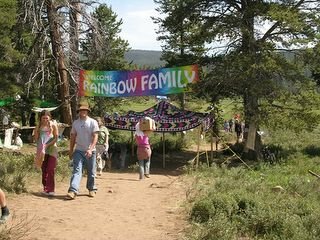 We were met at the front gate by a couple of older hippies with walkie talkies who informed us that the feds had a road block further down and that they were aresting, searching (with dogs)and ticketing people going to the gathering. Suprise suprise.. 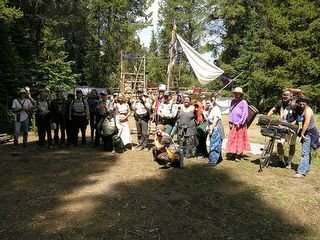 This back and forth between the forest service and Rainbow has been ongoing for years, with the feds trying everything possible to put an end to our first amendment right of freedom of assembly. In 1995, after losing sevral court cases to the family, it was ruled that the feds have the right to decide "time, place and manner restrictions". From that came this new rule that any gathering larger than 75 people required a free permit. The problem is that in order to obtain a permit, someone needs to sign it, which means taking responsibility for 20,000 plus people. Not only that, but rainbow has no recognized leaders or organizers in the way a religous group, the girl scouts or a festival would, so there really is no one to sign! After a brief discussion we all agreed to take our chances. We went about 7 miles down this windy mountain road until we arived at the roadblock..a bunch of green forest service trucks and uniformed forest service officials standing around. We stopped and opening the door with a big grin and playing dumb, we asked what this was all about. The woman forest service agent was quite nice and wanted to inform us that this was an illegal gathering and that, if we continued on we could be subject, at any time to arest or ticketing. We thanked the woman, explaining that we had come a long way and that it was our first amendment right to gather on our public land and we would be going on. She nodded, we waved and off we went! Unfortunately, for so many others this was not the case. At some point I guuess they received their orders and inevitably there were hundreds of arrests and tickets. 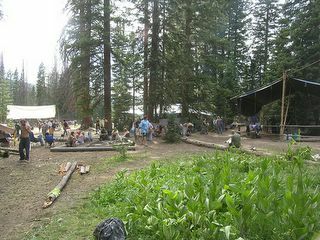 So many in fact that they set up a makeshift courtroom at some remote forest service fire station, and volunteers at the gathering ( lol..we are ALL volunteers at a gathering) trucked bus loads of people out to make their court dates. This continued for another week or so until they realized, as always that the wave of people comming in could not be stopped and to do so would require the national Gaurd..so they gave up (or at leat reduced their ticketing activities) and all went well. There were some tense momment's however, especially early on when 200 gatherer's decided to confront a roadblock of police armed with riffles. The gather's joined hands and walked toward the roadblock, oming all the while. Following is a link to some amazing video footage of part of the incident..unfortunately this otherwise peaceful act of civil disobedience is punctuated with highly provocatory and negative cooments from a disgruntled and obviously frustrated A Camper. Check it out.. Despite all this the gathering for us was a good one (excluding a week long toothache for Moss and a bout of stomach flue for me), we met many new friends and saw many old ones. Unfortunately my camera battery charger was lost and we were unable to replace it until recently, so the whole summer we were unable to take pictures. After the gathering we drove up the backbone of the Rockies ( taking the back roads whenever possible), through some truly trecherous roads, some of which were still being made ( I'll try to get a video I took up) and into Oregon. We stayed at a free campground, right on the Mckenzie river, and down the road from Cougar Hot Springs, for about two and a half weeks. We stocked up..working like mad, making dolls and felt boots to sell at the Faerie Worlds Festival in Eugene. At the festival we met Brian and Wendy Froud, who both coomented that they really liked my work.I had a roving vendor pass and sold 1000 worth off stuff, many of which were custom orders. We stayed a few weeks in Oregon, visiting with some friends, before meandering back down the coast via the 101 freeway bringing us full circle back to Santa Barbara, where we are at this time. We are currently busy filling the orders taken at the Festval, basking on the beach and working another good initiative..lower tuition for Community Colleges. Our plans, as always are tenetive and sporadic.In afew weeks we may leave for Northern California, then head to the east coast so I can visit my mom, who is sick. After that we need to decide on a place to winter over. Any suggestions ?? 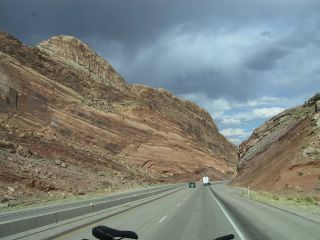 On our way to the gathering..a view from the captains chair..
At a rest stop in Utah. Moss takes some time off from driving to enjoy the view ( wich you cannot see here, but trust me..it 's a GOOD one) at a rest stop in Utah..
Casper enjoys a good stretch at the rest stop, after many long hours of bus travel. 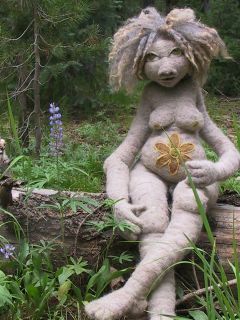 One of my newest creatures, here shown enjoying a lovely lupine flower growing in Colorado. Thank you all for the concerned emails regarding our well being ..we are fine, and no, we have not been abducted by aliens or run off to live with some remote tribe in the jungles of south America. The truth, I am afraid, is far less spectacular, but only slightly so..
All told we stayed in Santa Barbara for nearly two months,...working very hard on the alternative energy and marijuana initiatives and saving green energy to get us through the year. 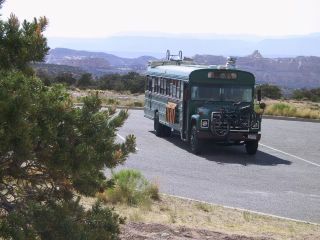 We met some wonderful people and even managed to do a little bus work on the side. Southern California has always been one of my least favorite parts of the country, in sharp contrast to it's sister, Northern California..which is one of my favorites. The last five years however have found me ( due mainly to financial and familial reasons) having to spend a good deal of time in southern California. Faced with this reality I have been trying to make the best of it, seeking out the quiet, wind swept places at every opportunity and observing the bizarre and sometimes shallow culture. Santa Barbara is a very wealthy city, one of the wealthiest, yet oddly small and intimate. Because the cost of living is so high, the " middle class" is nearly non exsistent..the majority of folks are either rich, very rich or living on the street. What is intersting is how little physically divides the rich from the poor. In many of the other wealthy areas of southern California..it would be hard, if not impossible for a homeless or rubber tramp to live at all, as it has been effectively rendered illegal to do so. This was recently the case in Santa Barbara as well. In fact there has been, for some time an ongoing war of sorts between the city, who want very badly to sweep the whole unsightly "homeless problem" under the rug (for the benefit of the tourists and locals) and local grass roots activists. What it really amounts to is class warfare of sorts. In an effort to crack down the city has made it illegal to park anywhere from 2:oo am - 6:00 pm. In response, local activits have aranged a program where by one can get a permit to park for the night on several Santa Barbara county lots. In addition they are apealing the parking law..and so it goes..
For now, on any given day you will see a wide variety of vans, campers, rv's, bus's, shopping carts and rickshaws parked along the main street that borders the beach. Directly across, on the opposite side of the street you will find the million dollar resorts..and in them people who have paid unspeakable amounts of money for a room with a view of the ocean...not to mention the parade of rv's, bus', campers and shopping carts.. In order to respect the personnel privacy of individuals, I will not be using their real names. I was sitting in the bus working on one of my sculptures, when an energetic woman with fiery red hair, popped her head into the open door to say hello, and that she loved our bus. I invited her in and we ended up chatting for a good 45 minutes. Before she left we found ourselves invited to a party at her home in Monticeto... She wanted us to drive our bus up to her home and park it there ( I found this particularly interesting as usually people are demanding that that we move immediately from near their house or they will call the cops). She would then have a party and an "open house" type tour of the bus. The idea was to educate folks about veggie oil, solar and other renewable/alternative energies. Since this was keeping in line with one of our original visions, we readily agreed. The day came and we were met by, Dan, Brendas husband. He drove in front of us, leading the way as we followed behind in the bus. We soon found ousrselves winding through the narrow, steep hills of residential Montecito, passed sprawling mansions and palatial estates until finally reaching the home of our friends, a beautiful, earthy house, on a steep, tree lined street. We parked and went inside, passed the courtyard/ gardens, and through the glass doors leading to the kitchen. At one point in the night we were inside the house, enjoying the food and chatting, when suddenly Brenda steps forward and rings a bell. The room becomes quiet as all turn their attention to Brenda, who then proceeds to announce us as the "guests of honor". Their is a donation jar up front, she explains and she would like it if folks would donate to our bus project. Moss and I were stunned, frozen between fork fulls of food (which we were now almost choking on) as the room fell silent, all eyes were on us. "uh..well...gee".. I stammered, taking the fork from my mouth and setting my plate down slowly. I am VERY uncomfortable with public speaking , I could feel my face burning and my mind freezing up.Moss came to the rescue though, thanking everyone and saying a few words about our vision of a sustainable lifestyle, and how all the things we have tried to incorporate in our bus, and much more, can be applied to a stationary house as well. After the party we stayed over, chatting long into the night and enjoying our new friends. We had a lot in common. One of Dan's favorite bands is the Incredible Stringband, as it is ours. We showed him our DVD copy of Be Glad for the Song Has No Ending, and he delighted in the old footage, saying it brought back many memories for him. He also was a fan and friend of Joni Mitchell, as am I (a fan that is..). We ended up staying over a few days before then saying goodbye and heading back to reality in Santa Barbara. I am sure we will continue to keep in touch with them as it is quite obvious they are kindred spirits and literally some of the most loving and joyous people we have ever met. Another amazing person we met was Jason and his dog friend Dakota. Heir to a family restaraunt business in Texas, Jason gave it all up five yeas ago and set out on foot with Dakota. When I say gave it all up I mean gave it All up! He gave away all his possessions and created a rickshaw from some bike tires and scavenged wood. 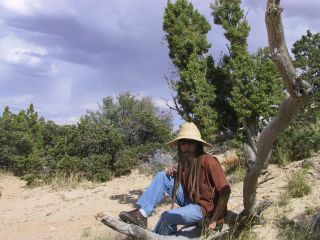 He then set out on foot, from Texas, to walk across the u.s...taking odd jobs here and there , moving at his own pace and camping in secluded areas on the edge of towns. What always impressed me about him was how incredibly articulate and clean he was. It's not that I think there is anything wrong with a little natural road dirt, and I know first hand how hard it can be to keep fresh on the road..but he always was. He always had a sparkle in his eye and some words of inspiration to share.The three of us shared many days relaxing on the beach, collecting shells and engageing in some great conversations. When we last saw him he said he was heading out that day..walking to the redwoods.. a life long dream of his. I know we will see him again somewhere down the road. Meeting Jason brought to mind another intresting nomad we once met..
Years ago, while on our way to the Wyoming Rainbow gathering we saw a strange sight on the side of the road. We saw what looked to be an old wooden gypsy wagon, a few on them hooked to together, with what seemed to be a train of donkeys pulling it. Walking next to the donkeys was a small bearded man in his 60's ( later we found he was in his 70's) wearing an engineers cap and red suspenders. We stopped to introduced ourselves and chat for a bit. His said his name was John and he had been on the road with his donkeys for close to thirty years. He said that he travels the western us walking along side his donkey's. In the coaches that they pulled was everything he needed to live sustainably. He had chickens for eggs and a goat for milk. In addition, he fished and took advantage of the abundant wild edible plants that grow naturally in the forests and meadows. In the spring he would approach a farmer and offer his services as a farm hand in exchange for a small plot to farm. Then, in the fall he would harvested what he grwew, canning and storing it in his wagons for the winter. We were enchanted and fascinated by John..and talked long into the evening. He offered to teach us his lifestyle, teach us how to build a wagon and everything else...he WANTED to teach his lifestyle, to pass it on. 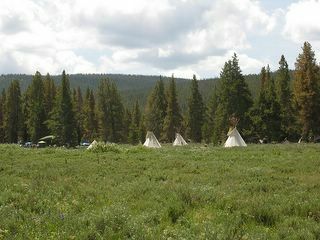 We were very tempted, but at that time quite intent on moving to Oregon and living in a tipi. We wanted to lay some roots. Seeing Jason, had brought all this back..and we are now seriously thinking, in a few years we would like to persue our old dream of traveling the states in a wagon,....carrying on the legacy of John Stiles. The only question is, do we do this before or after sailing the oceans in a pirate ship ?